Garden View Casita 5 is a two bedroom, one bath casita with a fully equipped kitchen and spacious living room. It has been recently remodeled and redecorated by our Interior Design Team, and comes fully furnished, complete with A/C, ceiling fans, satellite TV and Wifi. This little home is within walking distance to the Clubhouse, two pools and renowned beach and surf break, Playa Santana. Garden View Casita 7 is a two bedroom, one bath casita with a fully equipped kitchen and spacious living room. This casita comes fully furnished, complete with A/C, ceiling fans, satellite TV, and Wifi. This little home is within walking distance to the Clubhouse, two pools and renowned beach and surf break, Playa Santana. This second story unit, known as Villa Serena, is a three bedroom, two bath villa just steps away from Playa Santana, the Clubhouse, restaurant/bar and Sand Dollar Pool. 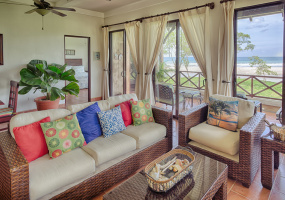 Fully furnished, and complete with a fully equipped kitchen and spacious living area, Puerta del Mar Villa 3-C also offers amazing views of the waves and sunsets at Playa Santana, making it the perfect vacation home or rental. 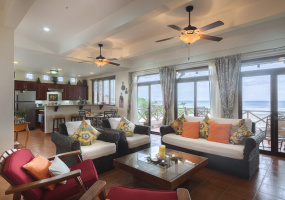 Puerta del Mar Villa 4-D is a two bedroom, two bath ocean view villa with it’s own private terrace. This wonderfully furnished condo offers spectacular views of the beach, surf and sunsets. 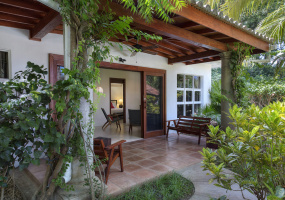 This villa is located just steps from Playa Santana and all of the amenities surrounding 'the hub' of Rancho Santana. JUST REDUCEDLots M-23 and M-24 are located high above Playa Escondida in the Alta Vista Neighborhood. 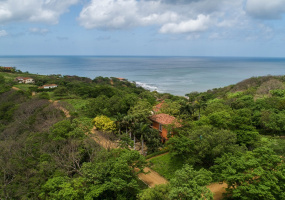 This 1.03 acre property features expansive views of the Pacific ocean, and is centrally located within Rancho Santana, making for quick and easy to access to both ends of our 2,700 development. Take this amazing opportunity to buy two lots for the price of one. 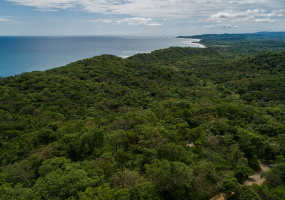 L-3 is a 0.25 acre lot situated at the southern end of the Las Playas neighborhood. Set high atop the cliff side, you'll never miss one of Nicaragua's unbelievable sunsets from this lot. About the Las Playas Neighborhood: The first phase of Rancho Santana development, Las Playas is now home to some of the most spectacular residences in our community. 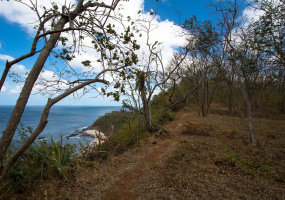 LP-17 is a spacious 1.77 acre lot situated in the Los Perros neighborhood. 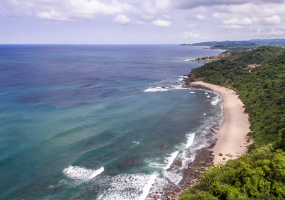 Featuring expansive views of the Pacific ocean and coastline, this lot is within walking distance of The Beach & Surf Club at Playa Los Perros and nearby surf breaks. About the Los Perros Neighborhood: Offering both proximity to the beach and large homesites, Los Perros is really the best of both worlds. C-17 is a 0.30 acre corner lot featuring incredible views of the Pacific Ocean. Situated in Las Playas neighborhood, this lot is a short drive away from both the Clubhouse at Playa Santana and the Pool House at Playa Rosada. About the Las Playas Neighborhood: The first phase of Rancho Santana development, Las Playas is now home to some of the most spectacular residences in our community. M-12 is a 0.44 acre lot in the Alta Vista Neighborhood located above Playa Escondida. This lot offers expansive views of the Pacific, while the primarily flat topography lends itself to build a comfortable home in a tranquil and peaceful setting.About the Alta Vista Neighborhood: Located on a ridge overlooking Playa Escondida, Alta Vista offers breathtaking panoramic views of the Pacific Coast. S-13 is a 1.33 acre lot situated in The Estates neighborhood. 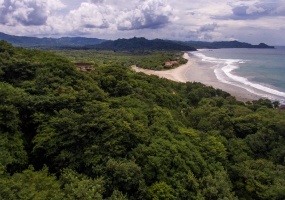 Just a short drive away from the Clubhouse at Playa Santana, this spacious lot offers a quiet place to enjoy the beauty of Nicaragua's lush coastal mountains and valleys.About The Estates Neighborhood: Located on Rancho Santana's highest ridge, many of The Estates homesites offer spectacular views of the ocean and valley below. N-14 is a 0.91 acre lot situated in the hills of the Bella Vista neighborhood, which offers spectacular views of the Ranch and the Pacific Ocean. The lot comes with approved plans by our Architectural Committee, ready to submit to contractors. It has been graded to accommodate a two-story home, guest cottage, laundry structure and an infinity pool. U-12 is a 0.77 acre lot in the Los Perros neighborhood.On this lot, you’ll find ocean, mountain and valley views that offer a wide variety of building opportunities. You will also enjoy steady breezes almost year round.About the Los Perros Neighborhood: Offering both proximity to the beach and large homesites, Los Perros is really the best of both worlds.